Ash Levine left the police force last year. He was a star detective, but when Latisha Patton, a witness in a murder investigation he was working on was killed, he blamed himself and left the force. Now, the LAPD wants him back. Why? Because Pete Relovich, an ex-cop, has been murdered and with pressure from the top, Lieutenant Frank Duffy is told to put his best detective on the case. The problem is, Levine is his best detective. Duffy visits Levine (who lives with his mother) and tries his best to woo the detective back to work. Levine finally agrees, but only because he hopes getting back to work will allow him to resume his search for Latisha’s murderer. Will Levine be able to solve two murder cases? Levine’s first request, once back at work, is to be partnered with Oscar Ortiz, one of the few people he trusts in the LAPD. Unfortunately, Oscar isn’t available so Levine declares that he will work alone. Not a wise idea when investigating a violent crime. Next up, Levine heads to the crime scene to see what clues he can find. Duffy tags along but knows enough to stay out of the way and keep his mouth shut while Levine works. The star detective has his own idiosyncratic way of working and doesn’t like to be bothered while studying a crime scene. The ‘Harbor Division’ has already examined the crime scene and concluded that Relovich was killed by a random junkie on the prowl for drugs. But Levine believes the ex-cop knew his killer, or killers, and the hunt is on. Of course, Levine still has plans to solve Patton’s murder. Things are about to get messy – and very dangerous. 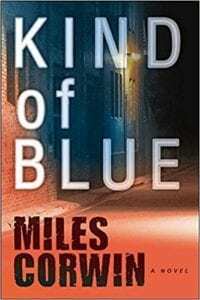 The author, Miles Corwin, has worked as a crime reporter for the Los Angeles Times and the knowledge he gained of crime scene investigating at that job comes through on the pages of Kind of Blue. Every autopsy, each interrogation of suspects and witnesses alike, as well as the melodrama of the squard room read realistically. This author has been there, done that. While there is plenty of fast-paced action in Kind of Blue, there are a few spots where the story slows as the author gets a bit sidetracked. For example, a new girlfriend of Arab descent has Levine wondering if a Jewish-Arab relationship could ever work. Additionally, a surfing expedition does lead to a clue in the murder case, but it takes numerous pages of surfing before the clue comes to light. It would have worked better to shorten these escapades. Overall, however, the author stays on target and keeps the reader entertained. Levine’s story is told in the first person, which threw me at first as it seemed a bit awkward. But once I got used to his “voice,” the story drew me in and the pace seemed to pick up. Levine certainly has some issues (his mother, certain members of the LAPD, guilt over Patton’s death) that were brought to the fore through his telling of the story. I enjoyed getting to know Levine in this book and hope to see more of him soon. Quill says: A mystery/crime novel that successfully takes the reader to the gritty back streets of Los Angeles.